*Author's Note: This is my 1500 published post, and I'm thrilled that it was for my beloved Shakespeare. The 1936 version of Romeo and Juliet was up till now one of the few versions of this oft-told tale I had not seen. I had seen three film versions of the Shakespearean tale of the two lovers of Verona before this one finally came my way. There was the 1968 version (which to me is the definitive version), the 1996 Romeo + Juliet Baz Lurhmann bastardization that attempted to dumb down everything by being "current", and the 2013 version that no one ever talks about. I'm also not counting West Side Story, though essentially it is Romeo and Juliet transposed to New York City (where street gangs are surprisingly adept at ballet). Well, now we come to an early version of this Shakespeare work. I found this Romeo and Juliet to be lavish, beautiful-looking, and did I mention lavish? It's a pretty good picture, save for at least two things. The Montagues and Capulets are bitter rivals who constantly get into fights. The Prince of Verona (Conway Tearle) has tired of their constant brawling, so he issues a decree saying the next group to cause a disruption will henceforth be banished. 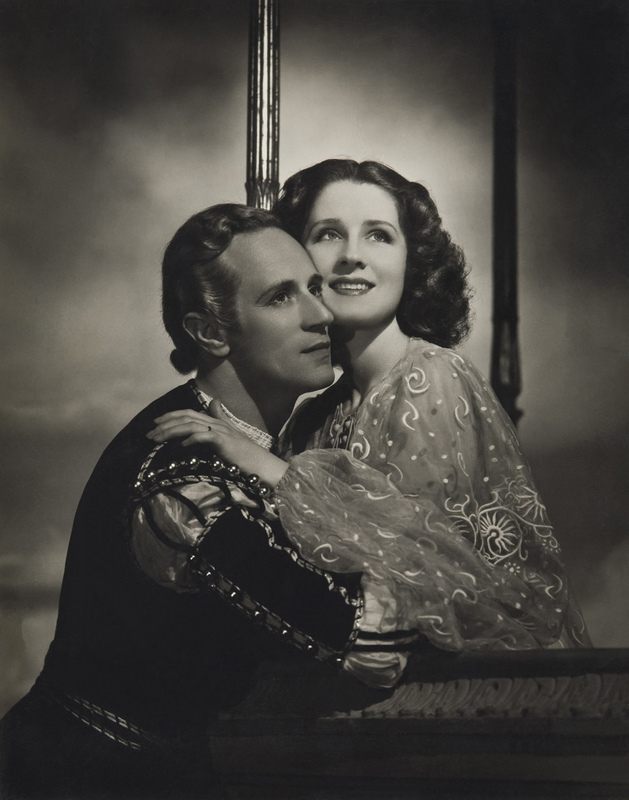 This doesn't matter much to either Juliet (Norma Shearer), daughter of Capulet, or Romeo (Leslie Howard), son of Montague. Juliet is content in her life with her Nurse (Edna May Oliver), while Romeo is besotted with fair Rosaline. Egged on by his best friend Mercutio (John Barrymore), they crash a Capulet dance, where Romeo, ever fickle, forgets all about his great love Rosaline when he sets eyes on Juliet. Juliet, in turn, is passionate about Romeo. This passion doth not extend to Juliet's cousin Tybalt (Basil Rathbone), who detests ALL Montagues. If it were up to him he'd kill Romeo on the spot, but his uncle orders him not to. The two lovers pledge themselves to each other and with the machinations of Friar Laurence (Henry Kolker), they marry. Of course, this is secret, and after Tybalt kills Mercutio (though Romeo inadvertently caused Mercutio to be a 'grave man'), Romeo kills Tybalt and he is banished, his life forfeit if he is found in Verona. Juliet is beside herself with grief: her cousin dead at the hand of the husband she cannot name. Even worse, her father pushes her to marry the Prince Paris (Ralph Forbes), which would mean renouncing both her one true love AND commit bigamy. Friar Laurence comes up with a plan to save them all by giving her a drug that will fake her death, and while the family mourns, Laurence sends message to Romeo to collect her and they run off together. Unless you are really, REALLY ignorant, you know how all this turns out. I really don't have a beef against this version of Romeo and Juliet. The film is sumptuous to its very fingertips, with beautiful sets and costumes. 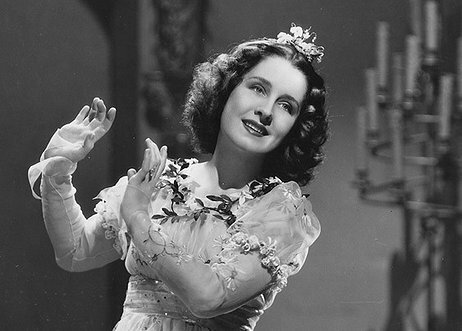 We even get a couple of elaborate dance numbers choreographed by the legendary choreographer Agnes de Mille (niece of the legendary director Cecil B. DeMille). Even some of the acting is pretty good. Rathbone earned one of the film's four Oscar nominations for his supporting role of Tybalt, and he was one of the few to appear to understand what the film needed was life. His Tybalt was all haughty fury at the Montagues, his eagerness to exterminate them insatiable. Oliver was delightful as the Nurse (though not as bawdy as I remember her from the stage productions I've seen...I figure even Shakespeare couldn't get much past the Hays Office). Andy Devine, who is best known for being comic relief in Westerns, actually acquitted himself well, his whiny pitch-altering voice working well as a dim-witted servant. The problem with Romeo and Juliet is not the performances or the artistic spectacle of it all. It's in our two leads (and another performer we'll discuss briefly a bit later). Norma Shearer at 34 and Leslie Howard at 43 (!) are simply far too old for their parts. It comes across as more and more laughable as the movie rolls on to see these middle-aged people apparently unable to make decisions for themselves. The sight of this matronly-looking woman being rocked by her old Nurse is downright bizarre, as if Juliet were an idiot. Seeing Shearer and Howard speak or have lines spoken about them, Shakespeare or not, makes things more unintentionally hilarious. Juliet's mother tells her daughter, "You are of a pretty age," (which makes one wonder what age she is referring to: Juliet's age of 13 to 15 or Shearer's age of mid-thirties) and when reproaching Friar Laurence, Howard utters, "Were thou as young as I?" I can imagine that 1936 audiences would have burst out laughing at that last one, given Howard and Kolker look almost like contemporaries than generations apart. I get that they are supposed to be the teenage lovers, and while they could have gotten away with this in a stage production, there is no way in a film people wouldn't look at them and wonder why these two grown people are acting (and Acting) so irrationally. Barrymore made a wonderful Mercutio: witty, amusing, and a bit of a rake. The only problem is that he is far, far, FAR too old for the part (even for a theatrical version). He looks like he's every bit his 54 years (and then some), and it just looks so bizarre, almost laughable (which is a shame given Barrymore could have done a radio version and made that work). George Cukor deserves a lot of credit for his directing of Romeo and Juliet in terms of the pacing, the production, and the smaller performances. However, I found his directing of Barrymore, Howard, and Shearer positively disastrous. I never found Mercutio's curse "A plague on both your houses" to be a comic line (though that was how Barrymore was directed to deliver it). Howard's Romeo was a bit of a wet blanket. I never sense the fury at Tybalt for Mercutio's death or the passion he felt for Juliet. He didn't seem all that mad that his best friend had been killed. Shearer, despite her Best Actress Oscar nomination, came across as the worse of the lot. It was genuinely hard to escape the thought that this Juliet was essentially an idiot, unaware of anything really. She was less impassioned teen and more unhinged spinster, as if Shearer was doing Miss Havisham doing Juliet. Shearer is so shockingly mannered, posing and reciting her lines in what I call "Shakespearese". Shakespearese is when you deliver Shakespeare as if you were reciting rather than attempting to speak them as if it were regular speech. This is something that afflicts many a production, both amateur and professional: this inability to speak as if the words were flowing from the characters and instead putting excessive emphasis in how the words come out versus come across. Howard, who as a stage actor really should have known better, was worse than Shearer in his Shakespearese, but at least he wasn't perpetually posing like Shearer was. Romeo and Juliet is a good film DESPITE OF, not BECAUSE OF, Howard and Shearer. It's a beautiful-looking film, has strong supporting performances, and is entertaining and pretty faithful to the original. Try as one might one can't really divorce oneself from the lunacy of these middle-aged people attempting with no success to pass as the star-crossed lovers who were not yet twenty. While a good and lavish version, it should have ended as "For never was a story of more woe, than this of Old Juliet and even Older Romeo". I agree with you 100% & in fact, am watching Romeo & Juliet (1936) as I write. That is how monotonous & tedious this film is, in several scenes. I am an English & Drama teacher who played Juliet in my college English Lit. Class. version of R & J is the finest, most true-to-form, as you well state. It was ridiculous to cast a 33 yr. old & 43 yr.old as Juliet & Romeo; Shakespeare's young lovers were teenagers! The most fervent performances are delivered by Rathbone, Barrymore & Oliver. The costumes, music & settings outshine the acting of the two leading actors. The abridged dialogue at times diminishes the cadence & impact of the lines. young lovers whose fiery romance spanned only a few days.